It wasn’t a wise choice, not picking out clothes because the ol’ closet didn’t have much to offer that wasn’t brand new (seeing’s how most of my running clothes are). I pulled out a pair of leggings that had started to loosen and grabbed my loose long sleeve then decided to just wear my shirt from last year’s event. It would all work out, right? Besides, it’s in the Race T-Shirt Etiquette to wear your first year shirt at subsequent races, to prove you aren’t a rookie n’at. The thing I forgot? The shirt, even 50 pounds ago at last year’s race, was huge. When laying out my clothes, I realized I’d made a mistake…but there really was nothing I could do. Ah, but there was. I had a pair of scissors with me to apply K-T tape, so I got to work googling. There weren’t many t-shirt tutorials that explained what I wanted, so I whipped out the handy camera and will share this no-sew shirt technique with you (as I am sure I am not alone in the whole lose weight then try to wear your veteran shirt in the years after club). My apologies for not taking a “before” photo, but by the time I realized it, I was in a pajama state (in other words, not safe for the blog). You’ll just have to trust me that it was a men’s XL shirt and way too big. 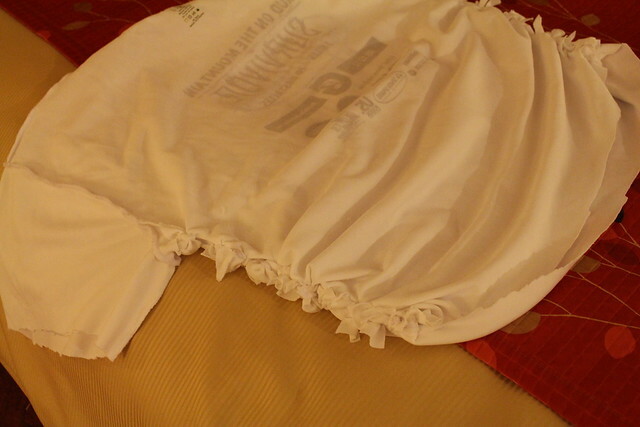 First, I laid my shirt flat and put my 2013 MOTM (women’s large) shirt on top of it. 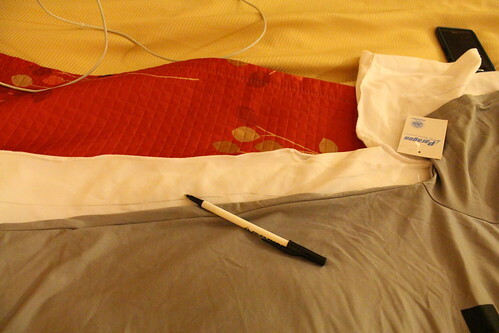 I grabbed a pen and noted where I should cut the sleeves and bottom. I noted where the sides needed taken in, too. 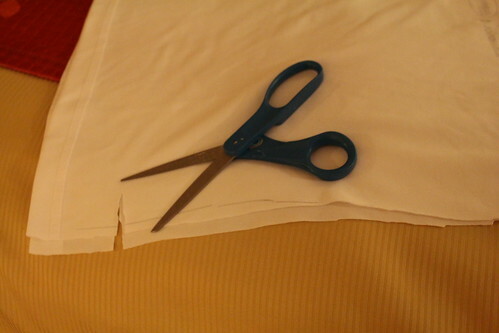 Next, I cut on the lines then cut up the sides on the hem, but I did not cut to the side trace. 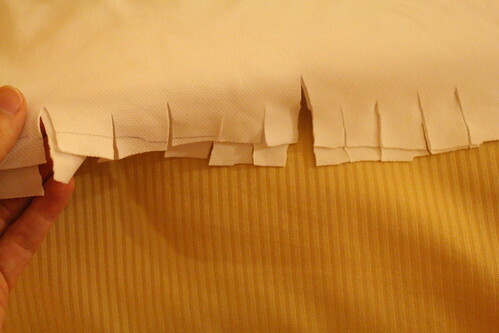 To make the sides fit, I cut several 1/2 to 3/4 inch strips from the edge to the traced line. 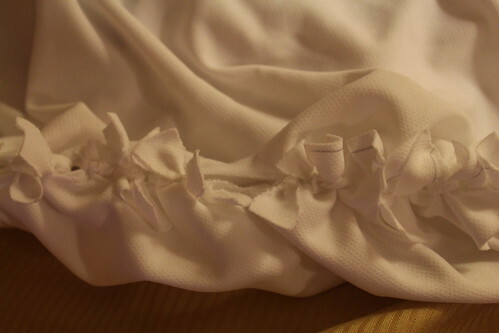 Now it was time to get comfy on the bed and tie tons of ‘lil knots up the sides, tying the front to the back of each slit. This is much like making a fleece no-tie blanket and wears on the fingers, but it’s worth it for no-sew. I have to report, it held up throughout the race and made it through the hose off and two washes that it took to get the mud out. I’d call that a no-sew success! 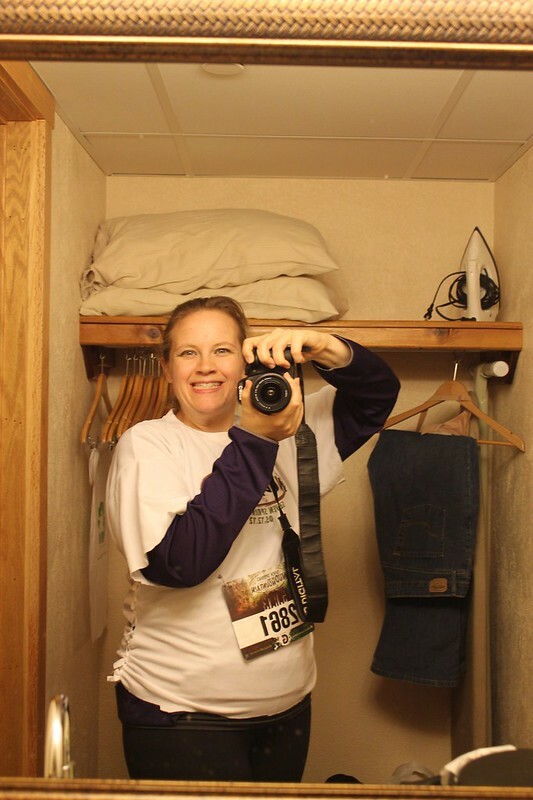 This entry was posted in Crafty, Running and tagged craft, no-sew, project, race shirt, t-shirt. Bookmark the permalink.